Prof. Ashok Chand has done his Master’s in Business Administration, he is an eminent Personality with Excellence in teaching. He had an Illustrious Career in Multinational Company from 1966 till 2000. 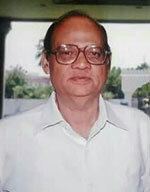 He retired as a Senior Vice -president in 2000. During his service of 34 years. He had a successful track record of building a Successful and a Vibrant Marketing team for his Organization. Widely respected or his deep Insight of Corporate Ethics and Marketing Management, he specialises in teaching Post Graduates with 12 years of teaching experience. He has been teaching various marketing Subjects, Business and Corporate Ethics and Marketing Management. His academic honours include IIPM Award for outstanding Academic Contribution or the year 2012. During the year 2000, he also won bright star award from Mafatlal Management Institute for Executive development program.